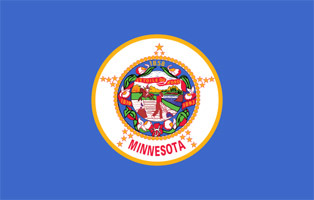 Minnesota is found in the Midwestern region of the United States. It is the 32nd state to be admitted in the Union on May 11, 1858. It is the 12th biggest state in land area and ranks 12th among the most populous state with 5.2 million people. Minnesota is called the “Land of 10,000 Lakes”. The state has a good share of waterways, parks, forests and wilderness areas which offer both residents and tourist’s different recreational and outdoor activities. The Minneapolis-Saint Paul metropolitan area, called the Twin Cities, is the center of Minnesota’s transportation, education, business and industry, and arts. It is also where 60% of the total population lives. The prairies in the western section of Minnesota are intensively given over to agriculture while the deciduous forest in the southeast have been cleared for farming. On the other hand, northern woods which is less populated, is used for mining and forestry as well as recreational activities. The majority of the people of Minnesota are of German and Nordic descent. However, the ethnic diversity has continually increased with the influx of immigrants from Asia, Africa and Latin America. The state of Minnesota is well-known for being one of the healthiest states in the United States. The majority of the residents of Minnesota engage in different outdoor activities and regular exercise. They ranked second for having the longest life expectancy, and have the lowest premature death rate in the country. Moreover, 91% of the population has health insurance.